Posted in Pork, on September 2nd, 2008. Probably like many of you, we had lots of family around over the Labor Day Weekend. Our kids & grandkids drove down from Northern California, and our kids and grandson who live near us were around too. On one night I made (with help from lots of family, thank you, thank you) a big California Asian dinner. We had some Asian salsa that I’ll blog about. 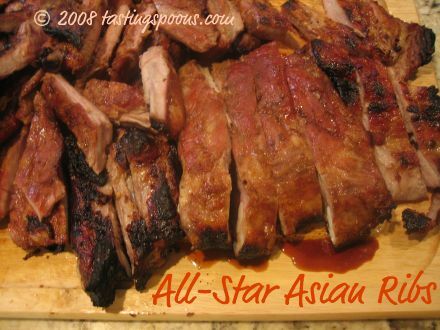 We had Asian Baby Back Ribs (this recipe), a Jade Noodle salad that’s sauced with pureed spinach and a bunch of other Asian ingredients. We had a big green salad that wasn’t all that Asian – just added some Cara Cara orange segments to it and sugar snap peas. And then I made Ginger Ice Cream to round off the meal. In coming days you’ll read about all but the salad. The star of the meal was the ribs. Since we’d done American BBQ style food recently for all these family members, I wanted to do something different. Hugh Carpenter has never failed me with his Asian-inspired items. So I went to his book titled Hot Barbecue and found these ribs with an Asian barbecue sauce. That does not mean teriyaki. Not one bit teriyaki. You could buy that at the grocery store. Not for me. All of our ribs weren’t baby backs (more tender), so we had ribs of all sizes. The sauce was quite simple – providing you have the ingredients. I did – but, didn’t realize I was short on hoisin sauce. So, I added some bottled chili sauce instead. Maybe not quite the same, but good enough. This is very garlicky. I suppose if you don’t like garlic you could eliminate it, but it would lose a lot of its character depth by doing so. To feed four people, it calls for 10 cloves of garlic. I tried to about 1 ½ times the recipe, and I used about 12 cloves. The trick to ribs, I think, is to have the heat high enough to cook, but not so high it burns. The Asian ingredients in this sauce do have some sugar in them, so put that with heat and you’ll get caramelization – or burn if it’s overdone. A word to the wise, that’s all. Grill the ribs until the meat starts to pull away from the bone. If it’s not doing that, continue grilling/baking/smoking. The recipe below includes directions for all three methods. Serving Ideas: Hugh Carpenter recommends serving with corn bread muffins, asparagus and golden beet salad. I made it with a jade noodle salad and a green salad. 1. Remove the white membrane from the back of all the ribs: using a sharp pointed tip, once you have a corner loosened, use a paper towel, grab it and gradually pull it off. 2. Leave the slabs whole if you’d prefer, or cut them into manageable sizes (like 5-6 ribs per chunk). Place in a large plastic bag, or a non-reactive container. 3. Combine the ingredients for the barbecue sauce. Rub all over the ribs, using your hands to make sure all surfaces are covered in sauce. Refrigerate for a minimum of 30 minutes, preferably up to 4 hours. May be completed to this point several hours ahead. 4. GRILL: For gas or electric grill, preheat to medium (350). If using charcoal, prepare coals and push to the side. Brush cooking rack with oil, then lay ribs meaty side up in center of rack. over grill and keep at medium temp. Grill until meat begins to shrink away from the ends of the bones, about 45 to 60 minutes (or longer if the temperature is lower). During the grilling, brush with more of the marinade. 5. SMOKE: Prepare smoker for barbecuing, bringing temp to 200-220. Transfer ribs to smoker and cook for about 5 hours. They’re done when the meat begins to shrink away from the bone. 6. ROAST: Preheat oven to 350. Roast meaty side up on an elevated wire rack, until meat begins to shrink from ends of bones, about one hour. During roasting, brush with more marinade. 7. To serve: cut meat into individual ribs. Transfer to heated platter and serve immediately. Per Serving: 770 Calories; 51g Fat (59.7% calories from fat); 35g Protein; 42g Carbohydrate; 2g Dietary Fiber; 148mg Cholesterol; 1375mg Sodium. Hot BBQ is a book I originally bought when I was living in Tokyo in the late 1990s and I have used it to the point it is in tatters (a great compliment to Hugh Carpenter and Teri Sandison) and in particular, I loved the Asian All Star Ribs – although the Szechuan Chicken and Cajun Chiken are also favourits, aw heck, it’s all really good!). When I was going back to Japan from Canada I stopped over with my family in Calgary and lo and behold I found the book again at The Bay where I proceeded to buy copies for all of my siblings, who use it religiously now. I have messed around a bit with this recipe over the years either due to the fact that I love maple syrup (cliche Canadian I know) or because I can’t find exact ingredients in Japan. This is great with pear sauce in place of the plum sauce (or even blueberry or apple sauce) and the aforementioned maple syrup is fantastic in place of the honey. Thanks for posting this. I am making an experiment with the ribs tonight and the book is at home so I wanted to check the ingredients to ensure I have all the right stuff. I’m going to boil some ribs in beer tonight and then soak in the sauce overnight (kind of skeptical about this, but I’d like to try in order to reduce grill time) and the other option is to bake in low oven in the sauce, reserving a bit for the grilling. Wish me luck.